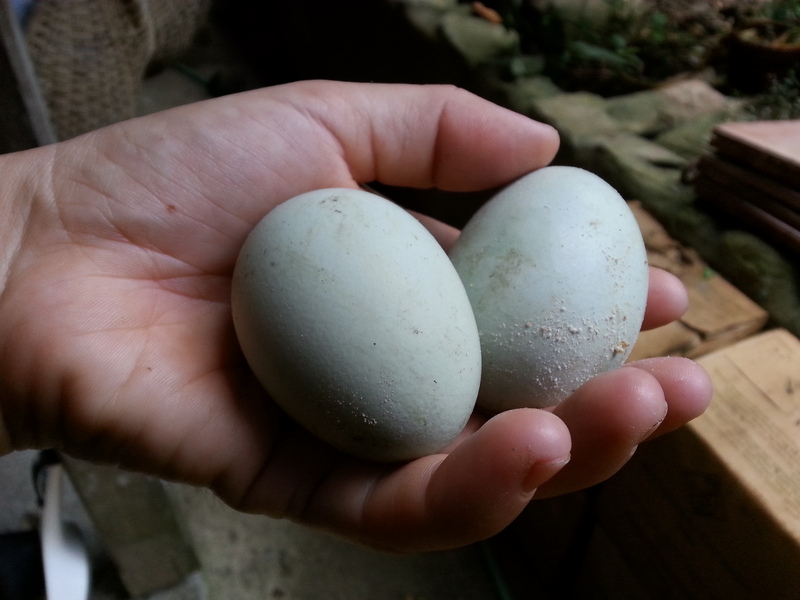 My old ameraucana hen is back to laying prolifically! It’s been a hectic week, and it’s not over yet! 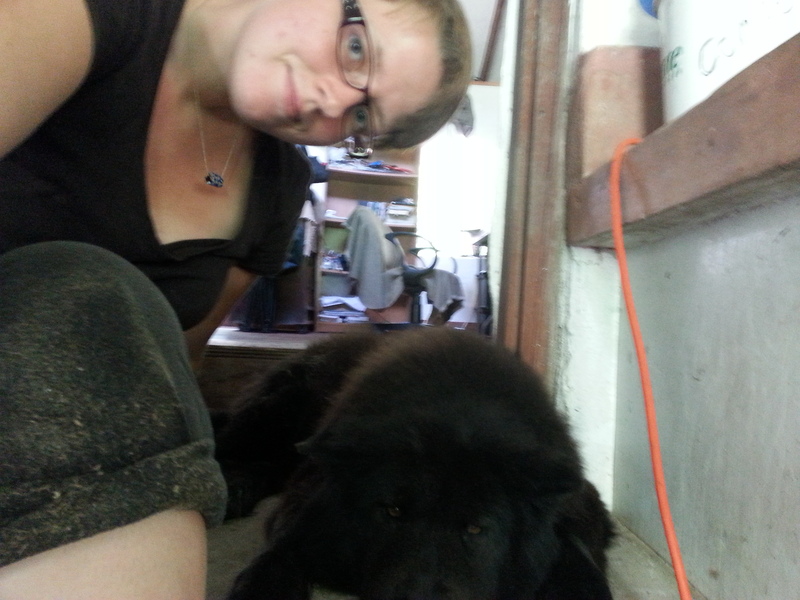 I made some significant progress on the Nid ceiling – a long-dreaded task that’s bad, but not as bad as I expected – whilst Mandy, Hannah, and Julie leveled and tiled half of the kitchen floor in the main house. 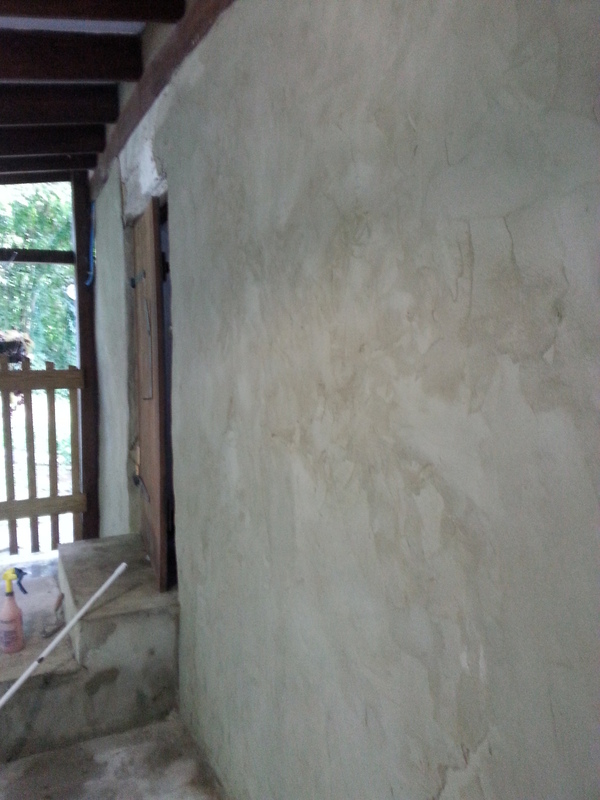 Mandy and I were going to chug right along and do the second half today, but somehow we had both forgotten that the wall needed to be plastered first! 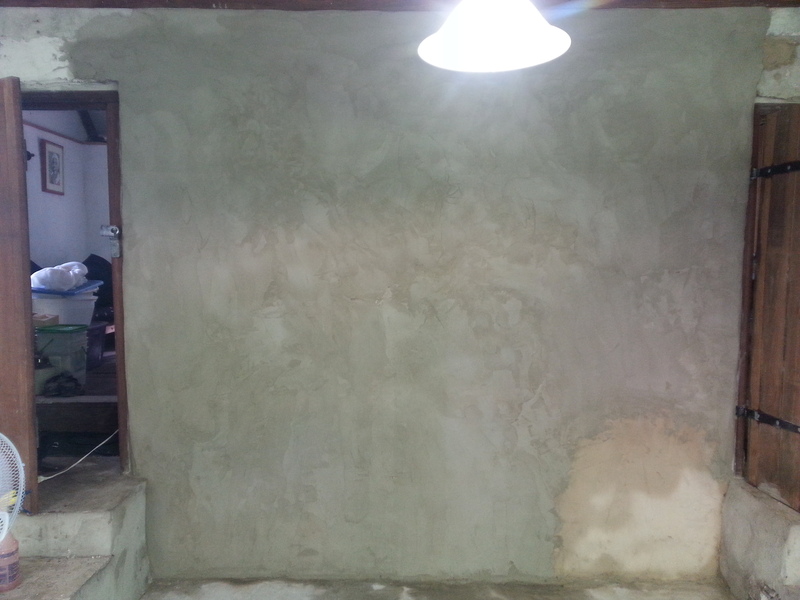 So it came to be, I plastered a rather large wall before breakfast…well…brunch. 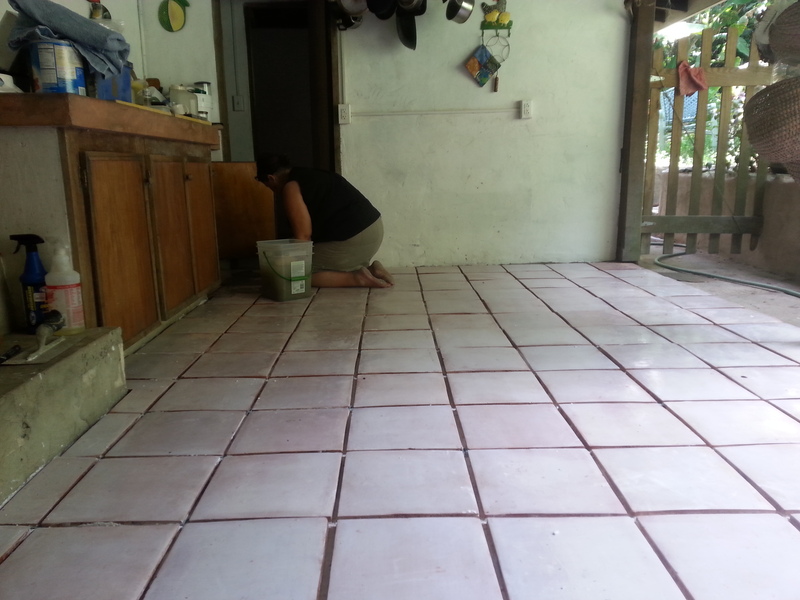 Tile happens tomorrow, then grout, then sealant, and we’ll finally have a gorgeous, properly functional kitchen floor! 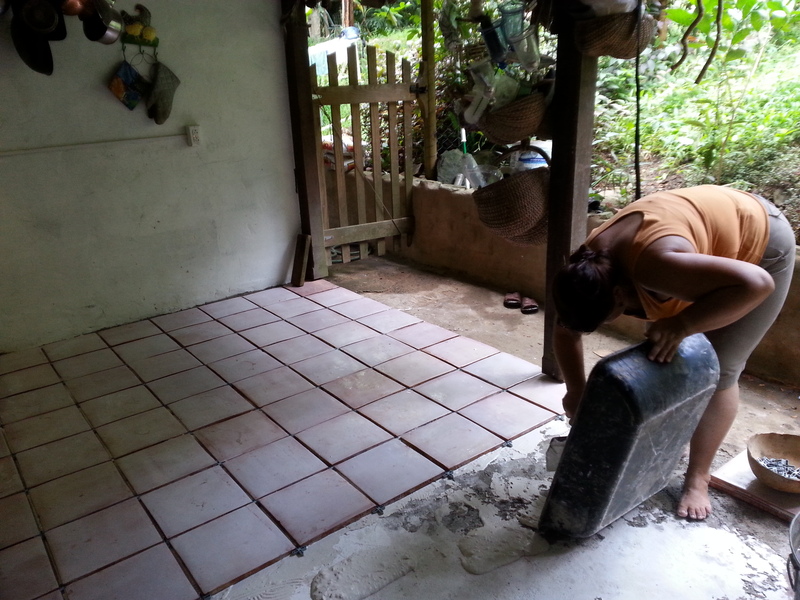 Mandy, laying tile on the kitchen floor. 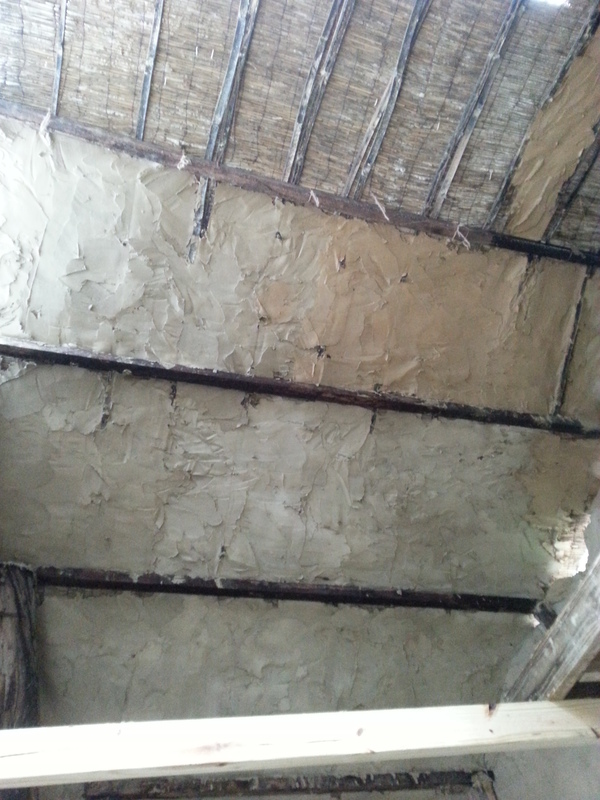 My plastering job on the kitchen wall of the main house. Apart from all the work, this was Julie’s last week with us – it’s been such a pleasure to have her, in all of her enthusiastic, hard-working, quick-learning glory! I send her off this afternoon with great expectations of her next adventure, in Puerto Rico. Hannah has now been with us for two weeks, and is learning to lay tile, plaster, and do many things around the garden, including implementing a new experimental bed in the vegetable garden, with an under-layer of coconut husks, then leaves, then compost, then finally soil. This is inspired by the Hugelkultur concept, which utilizes rotting logs to form a raised bed, providing a steady source of nutrients for many years. 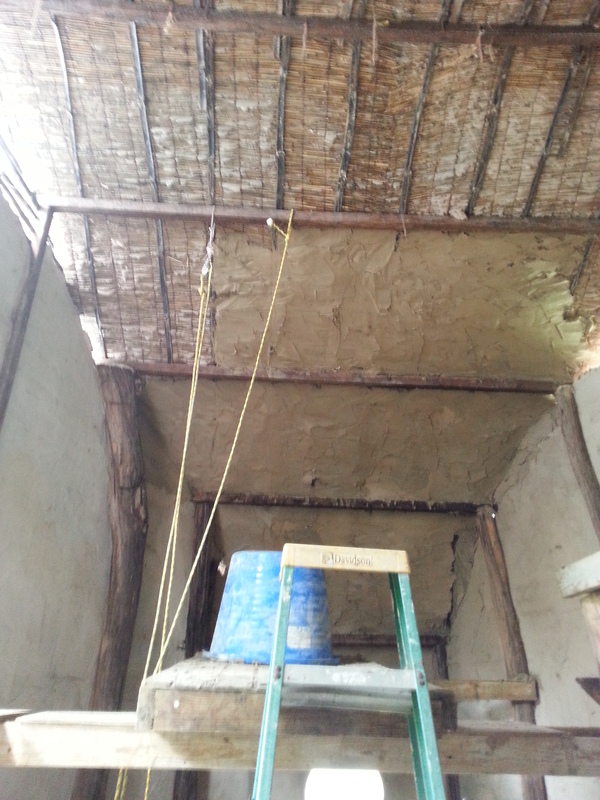 Nid ceiling: day 2. Up to the middle of the roof! 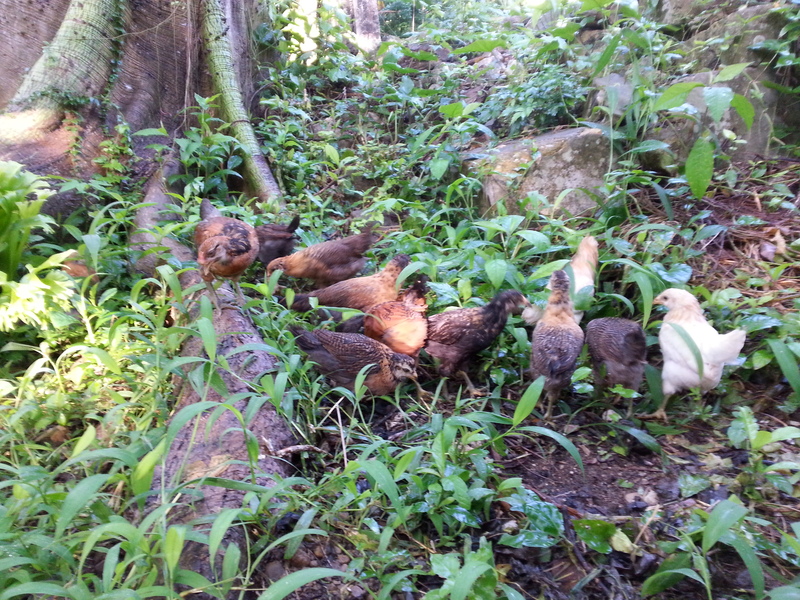 The chicks are now almost 8 weeks old, and have graduated to free-ranging in the daytime. 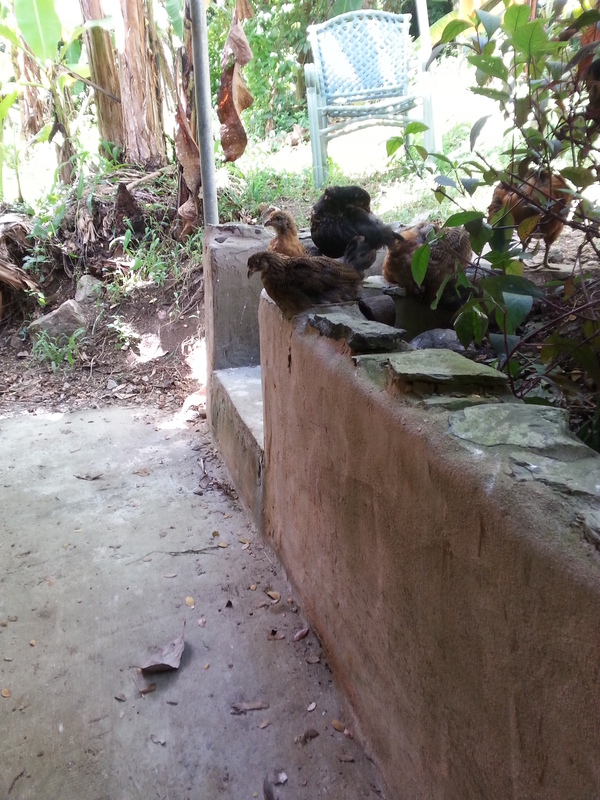 I was loathe to let them out, after my previous experience with mongoose killing sprees, but the chicks were becoming aggressive towards each other due to being penned in, so out they went. 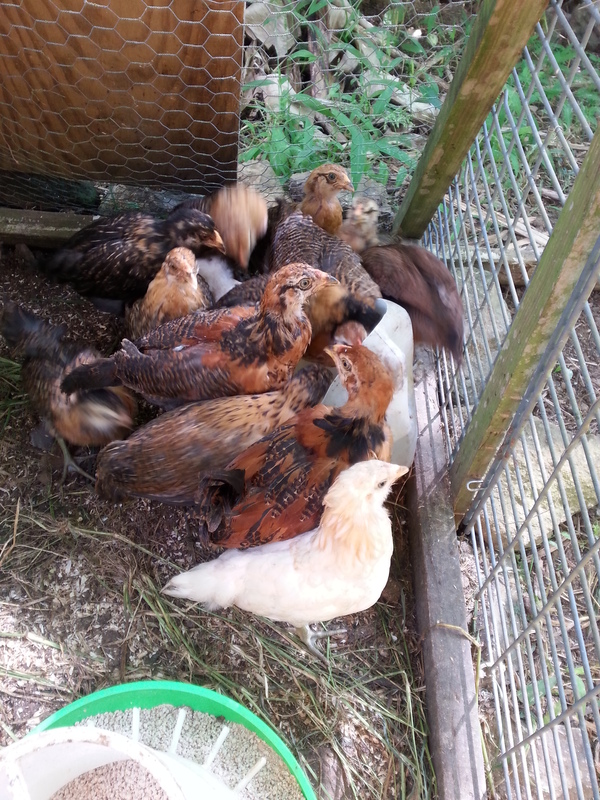 3 days in, I still have all 14 chicks, so I guess they’re ok! They come into the coop at dusk to be locked up for the night, and wait patiently in the morning to be let out (with much flapping, squawking, and other ado over nothing), at which time they meet up with the older hens, scratch, play, and do other chickeny things. Corn, peas, beans, arugula, kale, chamomile, watercress, green and red okra, quinoa, and pepper seeds have been started for the winter season – some to go in the new Hugelkultur bed, some to go elsewhere around the garden. Soon we’ll have lettuce going as well, once the daytime temperatures have dropped just a little further. Winter here is a time of salads and a lush variety of veggies after the comparatively barren summer months. On the other hand, soon avocado season will be over, and we’ll have little fruit except for citrus and bananas for the coming months, with a sugar apple or soursop here and there. Hopefully by next year we’ll have some more guava, sugarapple, soursop, surinam cherry, and abricot trees in the ground and nearing maturity, extending the fruit season significantly. All in good time. 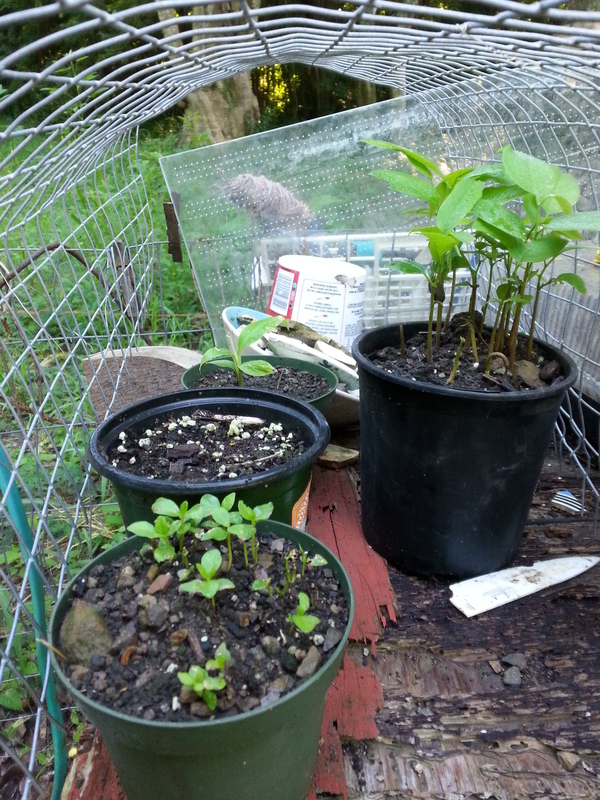 Guava, soursop, and banana sprouts. Are you on St Croix? Arriving soon? On Saturday, November 8th, we will be hosting our second Coffee Morning with Haitian coffee and wood-fired cinnamon buns in support of Good Samaritan of Haiti Inc., featuring Haitian artwork and crafts, plus a full range of Nidulari comestibles. A $10 donation to GSH covers coffee and a giant cinnamon bun, and supports life-changing projects in Ille A Vache, Haiti, managed by Mandy. Please RSVP on Facebook and tell all your friends! 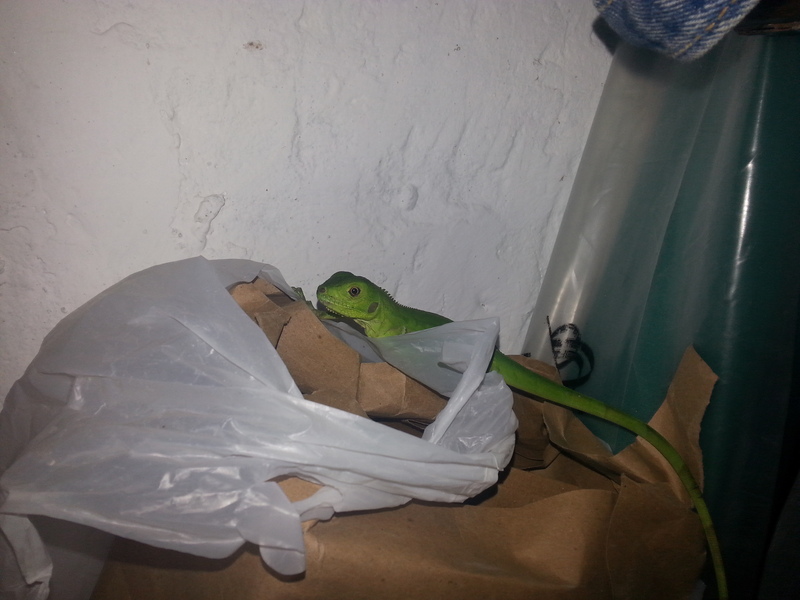 A friendly night-time visitor (iguana).